In the spring of 2012, The Promise, an award-winning independent television production, which had its UK premier on February 6, 2011, briefly appeared on TVO’s program schedule. Without any explanation, the listing was removed. As a pro-Palestinian sympathizer, I was eager to see the program. So I emailed TVO – in what was to be the first of a series of exchanges — and asked when the acclaimed 4-part serial would be rescheduled for airing. TVO responded that The Promise would be broadcast in the fall. 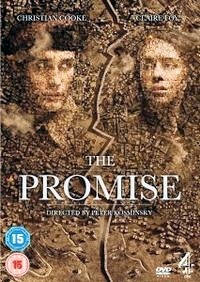 In the meantime, I purchased the DVD of The Promise from Amazon UK. (At the time it was unavailable for purchase from Amazon.ca (Canada) or Amazon.com (US)). The 4-part series focuses on the post-World-War-2 period in Palestine during the admission of 100,000 new Jewish immigrants into a partitioned territory. Moreover, the story captures the present-day disastrous legacy of the shameful British Mandate of Palestine. For a broad sample of reaction to The Promise, in the UK, France, Australia and other countries, visit Wikipedia at Reception. As mentioned above, I first contacted TVO when it withdrew The Promise from a brief listing in its spring 2012 program schedule. TVO said the program had been rescheduled for the fall. “TVO is undergoing staff changes” and “shifting its programming strategy”. In particular, “social issue programming has changed”. A new Director of Content Programming says they are “looking for a new programming slot” in which “to fit The Promise” but “no decision has been made or will likely be made in the near future.” I was reassured that TVO was under no pressure from external sources to cancel the show. Bottom line – It looks as though TVO has canned The Promise for the duration. What is it about The Promise that may have spooked TVO? In a phrase, I would speculate that “fear of stirring up divisive controversy” may have spooked TVO. The last thing an ultra-conservative, publicly-funded TV station wants is to air controversial material that risks offending viewers. And The Promise is certainly controversial. Consider the explosive plot — Just as 18-year-old Londoner Erin Matthews sets off to spend the summer in Israel with her best friend, Eliza Meyer, she unearths an old diary belonging to her seriously ill grandfather, Leonard “Len” Matthews. Intrigued by the life of an old man she barely knows, she takes the diary with her, and is stunned to learn of his part as a soldier in the post-WWII British peace-keeping force in what was then Palestine — a peace-keeping force that eventually abandons Palestine and its Arab inhabitants. Left to her own devices, after her friend Eliza begins National Service in the Israeli army, Erin witnesses the complexities of life — for both Jews and Arabs — in this troubled land. And as Len’s story comes to life in flashbacks from the pages of the diary, Erin discovers the disturbing truths about his time in Palestine and the atrocities he witnessed when Jewish immigrants resorted to armed violence to secure a foothold in Palestine. Retracing Len’s steps in modern-day Israel, Erin sets out on a heart-breaking journey in an effort to understand the conflict, and, above all, morally impelled to fulfill a promise that her grandfather had made as a British soldier to a Palestinian father driven out of Palestine with his family by Jewish terrorist militias. Purchase the DVD – It’s available for sale at Amazon.ca (http://snipurl.com/26fyzaj ) or from Amazon.com (US) (http://snipurl.com/26fyz1o ). IMPORTANT NOTES: 1) The DVD version is a UK Region 2 PAL format that will not play on North American Region 1 DVD players. So you either have to have a Region-Free player or other player capable of playing Region 2 DVDs. 2) Playing time for this multi-disc 4-part serial is almost 6 hours). This entry was posted on February 21, 2013 by fjwhite in creative protest, evidence based counterpower, political action and tagged British Mandate of Palestine, Israeli cleansing Palestinians, Israeli terrorism, Israeli-Palestinian conflict, The Promise (2011 TV Serial).